He said, "What were you arrested for, kid?" and I said, "belligerently eatin' pasta'"
And all kinds of mean, nasty things, till I said, "And disorderly intoxication"
The first Mafioso boss can be traced back to the Cretaceous Period of the Mesozoic Era. The “Iguana Don”, as he was known, commanded great respect, even amongst Tyrannosaurs. Naples, Florida, natch, aka "the rich and their servants". 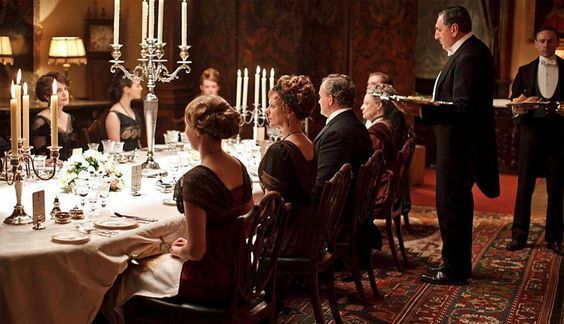 That's dinner at Downton Abbey in the hed pic, with the doughty Lady Mary at left. That was a good series before it jumped the shark. How can this administration turn a blind ear to the War on Carbs? Ah. So it was the Swans. And during Easter week, just remember the prime tots and pear of "and so it goes." Is this still in print? I have somehow broken the output jack for speakers on this laptop. Maybe I shouldn't have tried to stick my dique in it. Or maybe the new version of mediamonkey fcked it. Get yourself a USB DAC. Sound quality will improve a lot. I think too many competing audio programs. Rather I should say it was my management of the programs that caused the problem in the first place. Not to nerd out on ya, but they say the average computer has a 25-cent chip for to sound processing because the typical user only needs to hear error beeps and Skype phone calls. Whereas if you like to listen to music on your computer, through Youtube or any other source, you get a better result by offloading the process to a dedicated device and thence to your headphones, speakers or whatever. I'm pretty barbaric. I thought everyone knew that.